Four weeks ago, I posted here, asking what readers thought of mixing romance and mystery genres. I wondered: When do the two genres make a good fit, why does this happen (or not), and how can a writer mix the two genres to best effect? Readers provided excellent comments, ranging the gamut of romance/mystery collusion. Leigh mentioned the difference between the concepts of a story categorized as ‘romance with mystery elements’ vs. one presented as a ‘mystery with romance elements’—a very large difference, indeed, it seems to me, particularly in terms of structure and emphasis, where writing is concerned, as well as readers’ expectations. Fran and Janice pointed to a connection between the essence of dance and the essence of mystery—a concept that may, perhaps, be more important than it might at first appear—while Fran went on to provide an interesting “visual” in her comment. Elizabeth gave us some excellent specifics, stating that romance and mystery elements work well together, depending on story characters and plot conflicts, as well as story arc, stressing the need for these elements to organically fit the story, serving the plotline, instead of being gratuitously tossed in. An anonymous reader broached the subject of mysteries enjoying a romantic tension, even when the story arc doesn’t necessarily conclude with a Happy Ever After ending. And, C.S. Poulson, a reader I’d not encountered before, but warmly welcome, asked how the addition of romance to any well-written story could ever be a bad idea. Ms. Poulson's question surprised me, frankly, because it so closely resembled the question in my own mind, which had set me on this track of thinking in the first place. A properly executed romance subplot should—at least it seems to me—provide added depth to the story and help us get to know certain characters a bit better. Surely, I’d think, injecting the protagonist into a romantic relationship of some kind—even if it’s never acted upon—ought to provide a writer with ways to illuminate aspects of the protagonist’s philosophy and behavior that might otherwise be difficult to mine in a mystery without this flavor. While I’ve read many mysteries in which romance elements increased story depth and fleshed-out characterization, sometimes even raising plot stakes and ratcheting-up dramatic tension, I’ve also, unfortunately, encountered those in which romance elements seemed at odds with the mystery, breaking the mystery’s tension at inopportune moments or simply tripping-up the flow of the storyline. Which is why I found myself asking almost exactly the question posed by C.S. Poulson, in her comment: I wondered how the addition of romance to any well-written story could be a bad idea, and why? Looking for answers to this question, as well as wondering how to prevent the aforementioned problem, is what led to my last two posts, and this one today. In my last post, I told you about an experience I had, in the army, experimenting with impromptu explosive sine wave modulation. These shock waves, created when explosives are detonated, manifest themselves as sine waves that travel through those items targeted for demolition. In fact, according to explosive theory, they are largely the force that does the dirty work: tearing steel girders apart, punching holes through reinforced concrete, or throwing dirt high into the air while creating large holes in the ground. can result in great beauty. I wrote that post because, having ruminated about this subject, I’ve become rather convinced that there is a relation between what I view as sine wave modulation and mystery/romance genre interaction. It's a simple truth that has undoubtedly been quite obvious to many of you reading this. I, however, hadn’t given it any thought before. And, consequently, the idea is new to me. In short, it seems to me that success or failure in genre-mixing, in general, is not only concerned with points made by readers in the above-mentioned comments, but is also reliant on something I would call “genre harmony and resonance” and the resultant “amplitude modulation” incurred by the story’s dramatic tension. That mouthful may be enough to make you cross-eyed, though your own experiences may naturally have led you to internalize the same idea, but couched in a very different manner. I tend to think in fairly mathematic or scientific terms, however, and therefor think it might be a good idea to express myself visually. These plot diagrams look rather blocky in nature. But, others seem to model along a curve, or general curve . . .
. . . some of which tend to resemble sine waves or modified sine waves. And this mental picture, which existed in my head long before I ever found this diagram online, is what led me to think about successful genre mixing in terms of sine wave propagation. Which, naturally (for me, at least) called explosive theory to mind, and made me remember that experience I had modulating sine waves at Ft. Bragg all those years ago. (Example 1) Locate and time our explosive charges so that their resulting sine waves would cancel out. (Example 2) Meanwhile, my friends and I managed to locate and time our charges so that the resultant sine waves piggy-backed on each other, thus increasing the sine wave's amplitude -- which got us in hot water with a couple of generals. 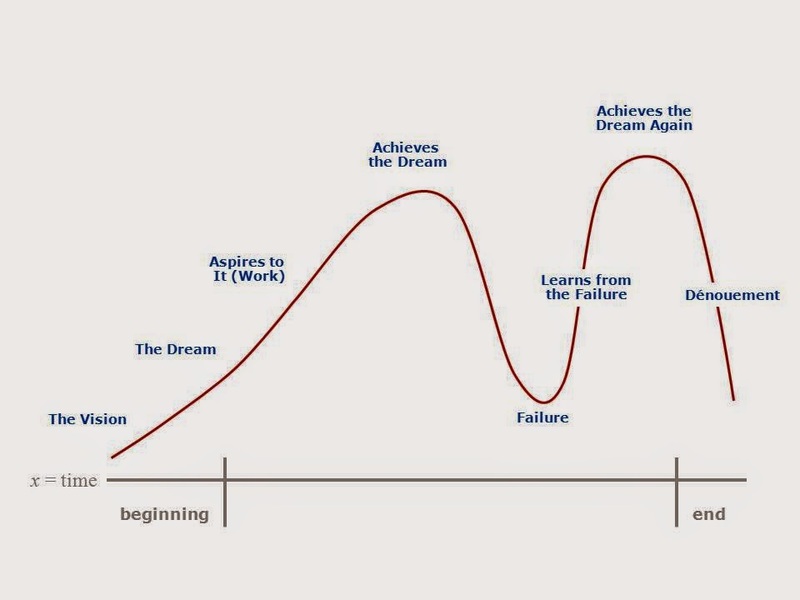 (Example 3) A more realistic example of what we achieved, however, probably more closely resembles this: The sine waves we created probably didn't quite piggy-back, being slightly out of phase (i.e. : the purple and blue waves are out of sync with each other), resulting in a sine wave (red wave) with increased amplitude, but not a sine wave with amplitude increased to the level we were targeting. This interaction of sine waves, that are out of phase with each other (Ex. 3), or else in direct conflict with each other (Ex. 1), became of particular interest to me when considering mystery/romance cross-genre pieces that did not seem to work. 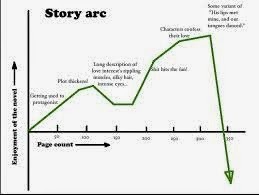 I'm still thinking about ways in which mixed-genre story arcs might be combined to create "sine wave" arcs of increased tension, or perhaps sometimes accidentally cancel each other out--resulting in reader disappointment. I'm also thinking about how to properly locate and time disparate elements, within a single story that enjoys a mix of two or more genres, with their tension arcs arranged in proper phase. And this question of Phase seems potentially crucial to me. 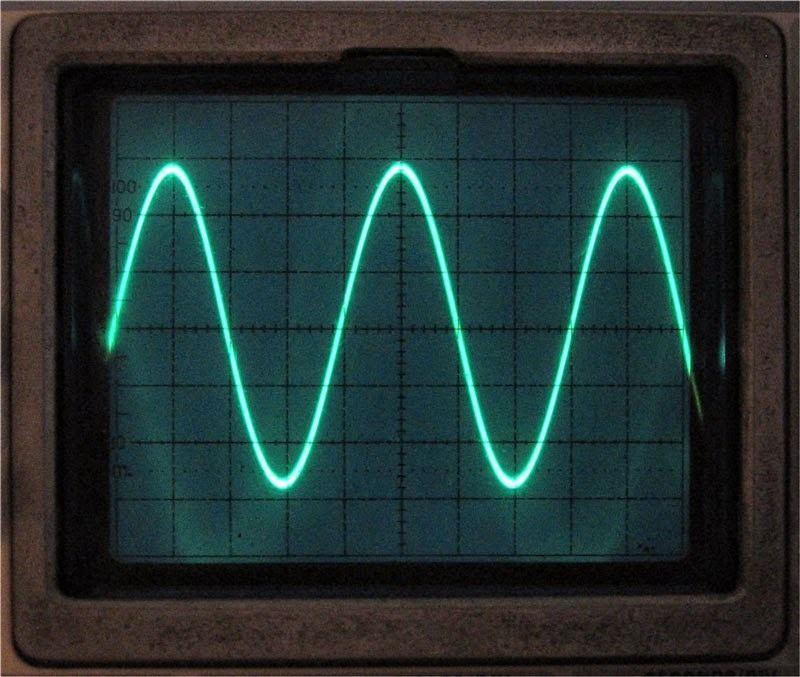 Sometimes, when sine waves interact, the result is a wave with perhaps a greater amplitude -- that wave is no longer regular. It's no longer a sine wave. As I explained earlier, I really don't understand music. Don't get me wrong: I enjoy listening to it. I like singing along, even. But, I've never been able to truly understand it. Which is why I'm a writer and not a musician. On the other hand, I do enjoy dancing. A LOT! And, I also know that musical notes or tones involve waves, and that these tones may be altered by modulating the frequency or amplitude of these waves. Another design created by sine waves. 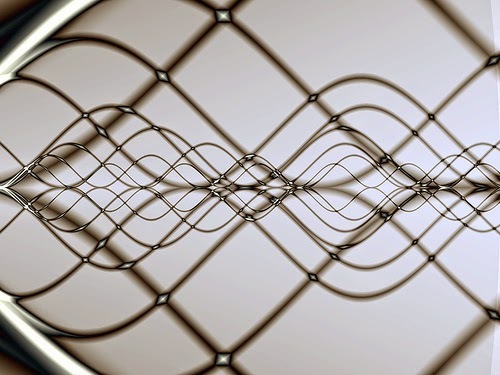 Harmony and resonance are two terms most people probably identify with music, thus I believe we begin to see why the concept of interacive wave theory (such as the one I practiced that day on the demo range) and dance come into play here. I used a dance metaphor in the pictorial portion of an earlier post, to illustrate my thoughts about the interplay of mystery and romance. This wasn’t a conscious decision my part. However, I’ve since come to think it may well have sprung from my unconscious (and not necessarily correct) understanding of the mixed-genre relationship. I'm sure that anyone who constructed a book with all the pieces fully plotted on a graph would only succeed in creating something too static to appeal to most readers. Literature is not math. 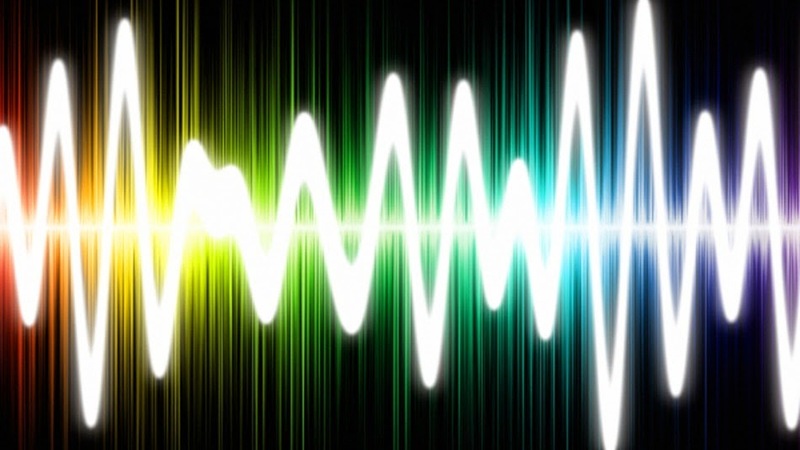 Yet, I can't help wondering about sound waves (which I understand ARE mathematical) that combine in harmony pleasing to the ear -- as well as the phase, frequency and amplitude of their component notes --wondering if this might help serve as a model for the preferable shaping of literary wave forms when combining plot elements or other genres. While doing my research, I was surprised to run across site about perfume fragrances at http://www.indieknow.net/2013/08/a-beginners-guide-to-fragrances.html in which "Lisa C." writes: “Ever learn about a story arc? 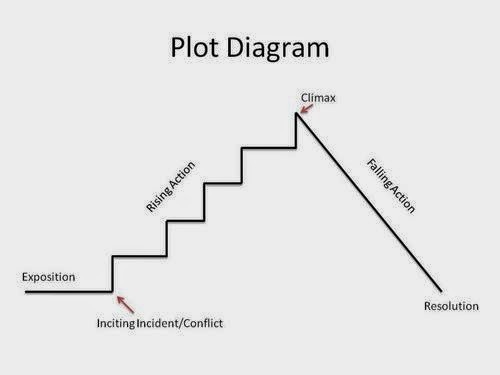 It starts off with your intro, leading to rising action, punctured with a climax and then falling action tying everything up in the conclusion (obviously there are more complicated arcs as well). Some interesting videos I found may be located at the following URL's. This is not only interesting in an intellectual way, I think it gives me real insight into a practical way to resolve a problem I've had with a historical novel I'm working on. There are so many characters in it, with so many intense personal things happening in their lives (that really happened and are important to the story), and there are so many complex events happening (that are also historical and important), that I've been at a loss as to how to weave the chaos into something non-chaotic. Previous authors who've written about this period in time have done it by being so over-simplistic as to actually miss the profound levels of humanity that actually exist in the people and events. They've jingoized it, so to speak. So although I knew I needed to find a meaningful way to distill it and focus in, and weave specific threads together in a -- well, a HARMONY I see now -- I couldn't figure out how. It was like being a child with tiny hands and trying to figure out how to grab something out of a sofa-sized treasure chest of golden chains and sparkling jewels all tangled around one another. You know you're going to get only part of it -- so which parts do you grab for, and why? 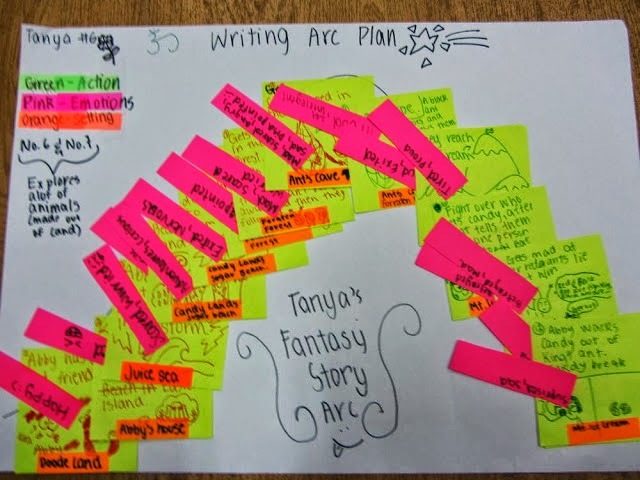 I have the "arcs" for each main person and the events themselves drawn out. Now I see how to use that to let the story resolve its own self into something meaningful that might have actually been perceptible to the people involved. My ramble here might not make sense, but my inner writer is nonetheless jumping up and down with gleaming eyes and a feeling of hope. Thank you!!!! I think, with mysteries, there's one school of thought that says the puzzle is what matters; another says that there have to be living characters so that the puzzle matters. Romance ups the investment ("The Postman Always Rings Twice" wouldn't be nearly as compelling if HE wasn't besotted with HER), and it is one of the major things people do with their time. And it is unpredictable. Why not use it? Anon, I’m glad this proved useful for you. As for worrying that your comment might ramble, I’d say you did a pretty good job—particularly in light of the disjointed, non-focused manner in which I wrote today’s post. I apologize for that; things just got away from me … including time, I’m afraid. Eve, I agree with you. I think romance can be a very useful element in a character-driven mystery. What kicked my mind into this confused ramble, which you see on my post, was the question: “Why does a mystery element sometimes seem to interfere with a mystery’s plotline?” I’m suspecting that the answer has to do with the literary location and timing of significant romance plotline elements, and the way the romance’s arc of rising tension might impact on the mystery plotline’s rising tension. My idea being: In some cases—when the genre mix works—the two arcs of rising tension complement each other, heightening the overall tension. In others, however, I suspect the two arcs of rising tension clash with each other in some manner, reducing overall tension and sometimes even cancelling it out altogether. I apologize that my post does not make this terribly clear. I'd also like to point out that I did not mean that I thought previous comments "missed the point" -- though when reading my post, this morning, I was disturbed to realize this interpretation was easily possible. Rather, I felt the comments were all excellent, and highlighted important elements a writer needed to incorporate or at least consider when mixing these two genres. My goal was simply to point out an additional idea that might be considered. However, I don't think I did terribly cogent job of explaining what I meant. So...no matter which way you look at it, it's all about balance? Claire, I'd say it's about resolving imbalance. As tension increases, things become more and more imbalanced until at last the overburdened hero or heroine put things right: Cinderella's shoe fits and the bullying stops. Snow White wakens to a kiss and the evil queen is destroyed. Pinocchio grows up, completing his character arc. The old tales point the way. Anon, the main challenge of historical writers (and world-crafting sci-fi and fantasy writers) is avoiding overburdening the reader with deadly detail. I came across a novel set in 1800s Boston that I was sure I'd like– it was about Harvard and poets and authors of the era and a murder plot. But the detail was so deep, it was like sludge and I couldn't finish the book. The trick is to paint like an impressionist– strokes that give a reader a feel of the place and era while avoiding minutiae: Show, not tell. Dixon, as a child, the first adult novel I remember reading was Fritz Lieber’s 1934 novel Gather Darkness. In it, scientists developed a sort of invisibility that’s being experimented with today: Using light waves to cancel each other out. The grey box with the double waves reminded me of two stories. One is a sweet little story that became the longest running play off Broadway, The Fantasticks. (And I see it reopened in 2006!) 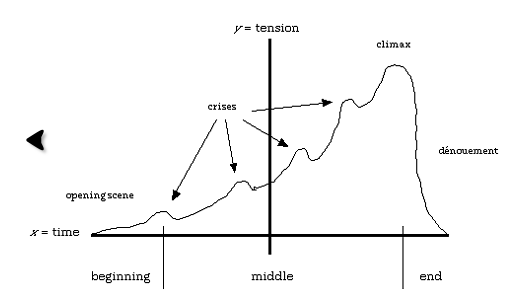 Midway, the play reaches a resolution that seems climatic (and is, according to the diagram), but then recommences and fights its way back to the final dénouement. The other story is by that favorite thriller writer, Wilbur Smith, Shout at the Devil, set in WW-I German East Africa. 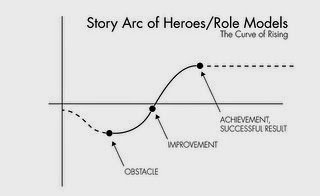 And here I part ways with both the book and the movie and the double-dip diagram. The first half of the story is a light-hearted caper, with the British Roger Moore and American Lee Marving tweaking the noses of the Germans. It’s a fun romp, until halfway through, the story turns ugly, very ugly. To me, it’s almost like two different and almost unrelated stories in tone. Of all Wilbur Smith’s books, it’s the one I didn’t like. 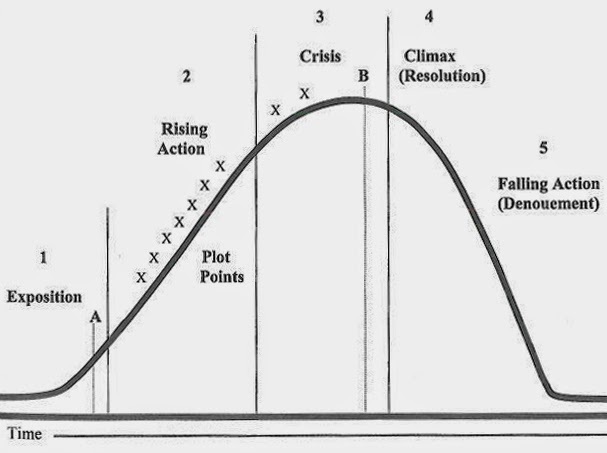 You make a pertinent point when you say that too-rigidly graphing plot and character elements would result in a boring story. But technicians have a major advantage of structure, what I think of as architecture, making things hang together. Thus for most novels (non-stream-of-consciousness), the organic portions of a story are sculpted onto a solid foundation and structure. Think Disney World (I seem to be in a Disney mode today.) Under the façade of castles and caves, of haunted mansions and monorails and African adventure, lies structural steel and concrete that holds it all together. That’s the magic in the Magic Kingdom. I'm afraid, Leigh,that I'm having one of those weeks in which I can't seem to say anything near what I mean. It seems I've caught a case of "foot in mouth disease." Doesn't often happen to me, but on occasion . . . oof! In fact, among other things, earlier this week, when I tried to tell my wife how pretty I thought she looked in her bathing suit, it somehow came out sounding as if I'd accused her of being about ten years older than she is, being fat and ugly (of which, she is neither), and that I thought she didn't look nearly as pretty as a young coed who happened to be lying in a bikini at the other end of the pool at the time. Like I said: Just one of those weeks. And, my blog post, today, is unfortunately no exception. I bludgeoned my way back and forth on it, all week long--between taxiing kids, counseling my son who's upset because his BF suddenly announced he is moving to California this weekend, and other oddities. I found myself constantly frustrated that what I had just written was not what I meant, and that I seemed to be having a bad time making any point at all! In fact, I tried to write a long explanation of what I actually meant (which is nothing like what I wrote in my blog), but I still can't seem to make my words come out right. Sorry, buddy. Where Will YOU Go Tomorrow?